As I did before, again I would like to share William Engdahl’s newsletter. This time the subject is ‘Beijing and the Turkic Uyghur Threat – A “Holy War” Against China’. against a then weaker Russian foe’. In this issue of my periodic newsletter I want to go into the deep background to a little-known role of US intelligence, the CIA to be more precise, in infiltrating China’s Uyghur Muslim population over a period of decades. Recent Western mainstream media and US Congress members have made allegations that Beijing has created internment camps in China’s western Xinjiang Province where an estimated 11 million Muslim Uyghurs live. While Beijing vehemently denies interring one million Uyghurs, the charges are serving to increasingly demonize China as an “enemy regime,” along with Russia, in Western media. The recent chorus of attacks on Beijing over treatment of its Muslim minority in Xinjiang conveniently ignores the relevant background to why Beijing is very alarmed about its Muslim Uyghurs. One major reason is that there are an estimated 5-18,000 Uyghurs fighting as Islamic Jihadists in Syria, and reportedly being groomed to return to China to wage Jihad against the government in the region which is the heart of China’s oil and gas pipeline networks and a hub for the New Silk Road. The role of Turkey and the Erdogan government in supporting what he calls “East Turkestan peoples” is at best unclear, at worst, malicious. At this juncture, what is clear is that China’s Uyghur problem has its roots in the decades of Saudi Wahhabite oil money financing CIA projects across Asia on behalf of the Muslim Brotherhood and their terrorist spinoff groups including Al Qaeda, Al Nusra Front in Syria and ISIS. 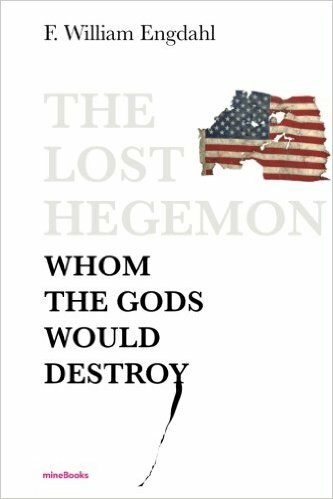 The following is taken from my recent best-selling book, “The Lost Hegemon: Whom the Gods Would Destroy…” The book is available as are my other titles on Amazon and in Kindle format as well. As well I would ask you also to consider going to the Donate button at the top of my website and making a contribution to support my continued publishing. own “Vietnam” defeat in Afghanistan. understood for the danger it posed. against a then weaker Russian foe. and Azerbaijan, Uzbekistan, Kazakhstan, Turkmenistan, and Kyrgyzstan. Riots and unrest in Urumqi exploded with deadly violence on July 5, 2009. Asia and Voice of America, both known CIA front organizations. Working together with the WUC was another exiled Uyghur, Erkin Alptekin. was cosponsored by Alptekin’s Unrepresented Nations and Peoples Organization. State Department since the beginning of the Cold War. that gave the WUC the grounds to issue their worldwide call to action. vehicles, and attacking buses with batons and rocks. “They took to the street . . .
Rebiya Kadeer for its information. all happy to see the nations of Eurasia cooperate. The CIA’s Gülen Movement has a network covering the entire New Silk Road of China into Xinjiang. Defense Department neoconservative networks at high levels in Washington. this criminal network, Gülen by 2013 had established more than 300 madrassas in Central Asia and what he calls universities that have a front that is called Moderate Islam, but he is closely involved in training mujahideen-like militia Islam who are brought from Pakistan and Afghanistan into Central Asia where his madrassas operate, and his organization’s network is estimated to be around $25 billion. was “elected” Prime Minister. 16 It was not clear who exactly “elected” Turani. intelligence cooperated with the CIA in those global Islamist Jihad operations. Turkestan Islamic Party Seal—a Koran surrounded by two Scimitars. Laden’s Al Qaeda in Afghanistan in the 1980s. from the CIA’s Graham E. Fuller indicated. quickly imposed Sharia Law, which was ruthlessly enforced by Adolat’s vigilantes. Adolat was initially tolerated by the newly installed President Karimov. Asia. Both Russia and China were the ultimate targets. friends at the CIA and State Department went far beyond the borders of Xinjiang. to be in a position to choke off, at will, China’s vital oil and gas lifelines. so earlier the “great friend” of America, now as the new emerging Great Enemy. military activities on blocking that growing Chinese influence. after the First World War and after. 1 Richard Labeviere, Dollars for Terror: The United States and Islam, Algora Publishing, 2000, p. 6. 4 Richard Labeviere, op. cit. 6 F. William Engdahl, Washington is Playing a Deeper Game with China, Global Research.ca, July 11, 2009, accessed in http://www.globalresearch.ca/washington-is-playing-a-deepergame-with-china/14327. 14 Sibel Edmonds, BEFORE THE OHIO ELECTIONS COMMISSION: DEPOSITION IN THE MATTER OF JEAN SCHMIDT, Plaintiff, vs. DAVID KRIKORIAN, Defendant, Case No. 2009E-003, August 8, 2009, accessed in http://christophgermann.blogspot.de/2013/05/chinas-central-asiaproblem.html. 17 Gillian Norman-Jilinda, op. cit. 18 Dru C. Gladney, and S. Frederick Starr, Xinjiang: China’s Muslim Borderland, Armonk, New York, 2004, Central Asia-Caucasus Institute, pp. 388–389. August 2010, accessed in http://www.vijayvaani.com/ArticleDisplay.aspx?aid=1341. 24 David Livingstone, op. cit. 25 Graham E. Fuller, op. cit., p. 46. September 8, 2013, accessed in http://usa.chinadaily.com.cn/china/2013-09/08/content_16952304.htm.